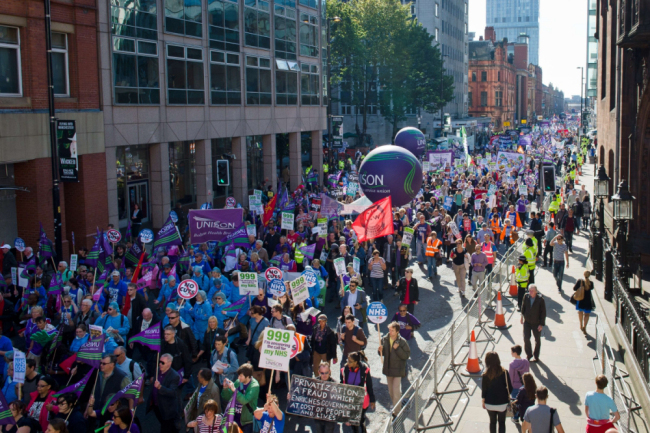 Today’s march and rally outside the Tory party conference was a real success. Well over 50,000 people marched. There was a strong trade union turnout as well as many different campaign groups and organisations represented. The anti-austerity movement had a serious boost today. Anger against austerity was focused around the ongoing attempts to privatise the NHS, with many protestors carrying placards provided by the The People’s Assembly saying ‘no cuts – save our NHS’. Owen Jones’ speech at the rally got an excellent reception. He made a passionate defense of the NHS and promoted the 5 November day of civil disobedience as a crucial event to keep the pressure up on a government lacking in legitimacy for its austerity plans. Owen will be speaking at the North London People’s Assembly Against Austerity on Sat 26 October, which is a fantastic opportunity to build opposition to the cuts in the region. If you were on the march, please leave your thoughts and experiences of the day in the comments below. This entry was tagged "no cuts" "save our nhs" "people's assembly against austerity" "owen jones", nhs299. Bookmark the permalink.